Brussels sprouts excite me! I love that for so much of my life, I avoided them like the plague. Their gross, gassy smell, their spongy, soggy texture, their bland flavor…blech! There are few things I wouldn’t eat, but brussels sprouts were on that short list. Were on that list. Now they top my list of favorite foods. And I love that! I love that even as a forty-something woman, I can still change my mind, still discover new things to love, still discover I don’t hate the things I thought I once did. What else will change about me? The things I think I know about myself today will change in the future, and I am reminded of this fact every time I am enjoying brussels sprouts. What can get more exciting than that? The very first brussels sprouts recipe which won my heart was this one, first published in the November 2002 Bon Appetit, Brussels Sprouts with Pearl Onions in Horseradish Cream. I have made this and recommended this often, always to rave reviews. I was considering that recipe for Thanksgiving, but then I came across this one from the September 2011 Fine Cooking, Pan-Roasted Brussels Sprouts with Shallots and Rosemary. I made this last night, and it was phenomenal! I mean, what couldn’t be phenomenal if covered in enough cheese and cream and bread crumbs and butter? 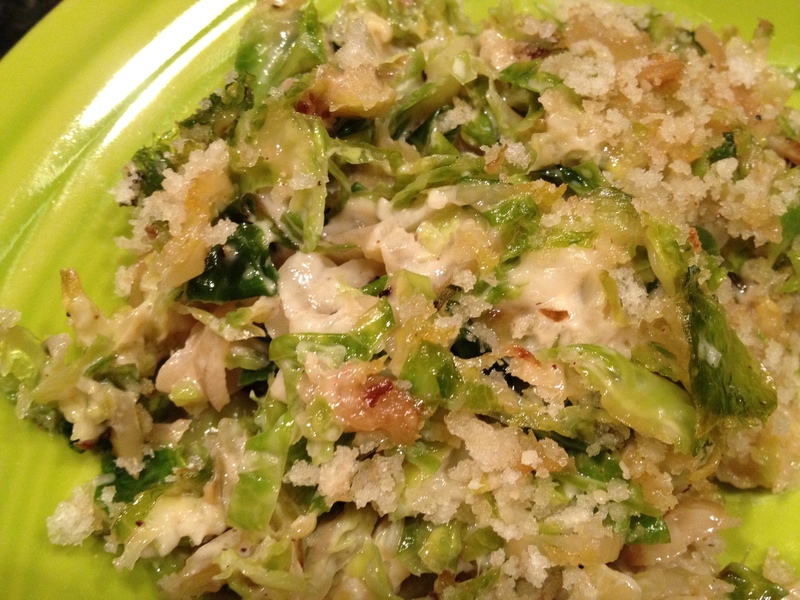 Even if you are not a big brussels sprouts fan, I hope you will try this. I have a feeling this could win over even the most reluctant brussels sprout eater. Position a rack in the center of the oven and heat the oven to 375°F. In a food processor fitted with the slicing blade, slice the Brussels sprouts and shallots. In a 12-inch oven-safe skillet, melt the butter over medium heat. Continue to cook the butter until it begins to brown and smell nutty. Set aside 1 Tbs. of the browned butter in a medium bowl. Add the Brussels sprouts, shallots, 2 tsp. salt, and 1/2 tsp. pepper to the pan and toss to combine. Cook, stirring occasionally, until the Brussels sprouts and shallots begin to soften and brown in spots, about 6 minutes. Remove the pan from the heat. Meanwhile, in a 2-quart saucepan over medium heat, combine the cream, Gruyère, nutmeg, cayenne, and 1/4 tsp. salt. Heat until the cheese is melted, whisking occasionally, about 4 minutes. Do not boil. Add the sauce to the Brussels sprouts, carefully stirring to combine. Add the panko, Parmigiano, rosemary, and a pinch of salt to the reserved butter and mix thoroughly. Top the sprout mixture with the panko mixture. Bake until the crumbs are browned and the Brussels sprouts are tender, 10 to 15 minutes. Let cool for about 5 minutes before serving. 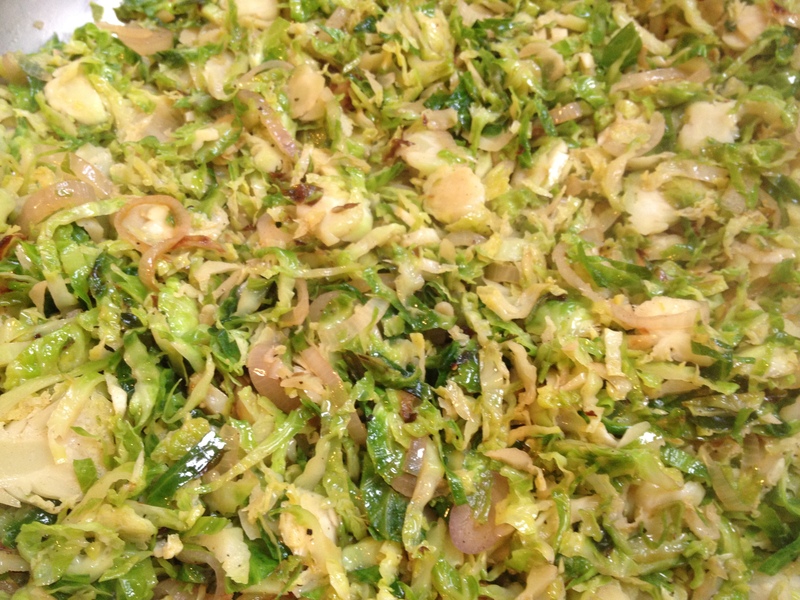 This is what the brussels sprouts and shallots look like after six minutes in the pan. On the plate and ready to convert more haters to lovers! This entry was posted in Side Dish and tagged brussels sprouts, Fine Cooking, rosemary, shallots, Thanksgiving side dish by Mom Mom's Apron. Bookmark the permalink.